Guelph-Wellington Women in Crisis (G-W WIC) is a feminist community-based organization providing services to women and their children who have experienced woman abuse and/or sexual violence. Marianne’s Place is a residential workplace operating 24 hours, 7 days a week. We are looking for a highly motivated individual with the skills and abilities to join Marianne’s Place team. If you are self-directed with the ability to work effectively within a team environment, are compassionate, creative and resourceful, please consider this opportunity. •	Provide Direct Service support, Group facilitation, Advocacy, Administration, Security and Maintenance. •	Deliver crisis intervention, crisis counselling services and individual and group support to callers and residents. •	Support women in navigating the legal, housing, income and child welfare systems. •	Facilitate dialogue concerning resident relationships, house rules etc. •	Act as advocate and resource person on issues of sexual abuse and domestic violence. •	Providing options, referrals and connections to women and community resources as needed. – Specialized training in sexual violence counselling, including childhood sexual abuse issues. – Specialized knowledge of trauma, mental health and substance abuse issues. – Post secondary degree or diploma in social services. – Minimum 1-3 years previous experience working with and advocating for women and children. 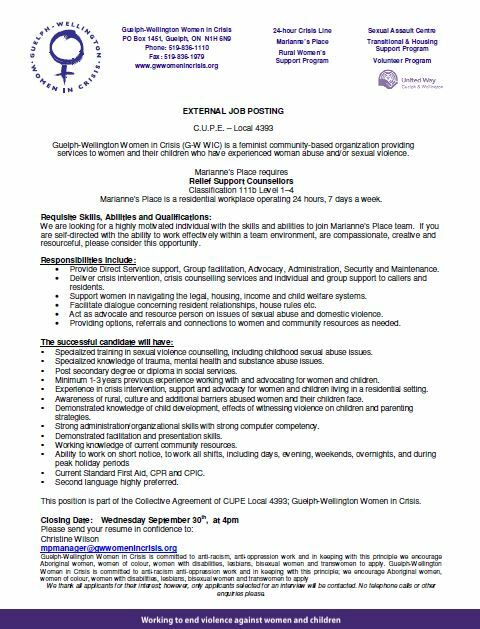 – Experience in crisis intervention, support and advocacy for women and children living in a residential setting. – Awareness of rural, culture and additional barriers abused women and their children face. – Demonstrated knowledge of child development, effects of witnessing violence on children and parenting strategies. – Strong administration/organizational skills with strong computer competency. – Demonstrated facilitation and presentation skills. – Working knowledge of current community resources. – Current Standard First Aid, CPR and CPIC. – Second language highly preferred. This position is part of the Collective Agreement of CUPE Local 4393; Guelph-Wellington Women in Crisis. We thank all applicants for their interest; however, only applicants selected for an interview will be contacted. No telephone calls or other enquiries please.